HISAR, Sept 5  Twentyfour persons were booked by the police at Tibha Dhana Sher here on charges of rioting and causing damage to a disputed religious structure. Six of them were arrested. CHANDIGARH, Sept 5  The Haryana Government has decided to spend Rs 66.50 crore for the development of technical education in the state during the current financial year. HISAR, Sept 5  Various deans and professors of Guru Jambeshwar University here have sought the intervention of the Chancellor, Mr Mahabir Prasad, into the "growing interference" of the Department of Higher Education in university affairs. CHANDIGARH, Sept 5  Giving away awards to teachers on the occasion of Teachers' Day in Haryana, the Governor Mr Mahabir Prasad, here today admonished both officials and teachers for dereliction of duty which had resulted in some unfortunate happenings. SONEPAT, Sept 5  The Rai police today claimed solving the alleged murder of Rajesh, son of Jaipal Jat, resident of Hassanpur village whose body was found from the field of Nahri village of this district on April 30 last. FARIDABAD, Sept 5  The police arrested seven workers of Haryana Agro at Palwal yesterday on the charge of sprinkling water on wheat stocks to increase the weight of wheat being despatched to the Food Corporation of India godowns in various parts of the country. FATEHABAD, Sept 5  Actions under the HUDA Act have been initiated against unauthorised colonisers here. The police has registered cases against six persons on three different complaints lodged by the Assistant District Town Planner. The incident occurred last night when the police resisted attempts by members of a particular community to offer prayers at the disputed place. This caused resentment among the members of the community. At least 50 persons gathered at the site and set on fire a police tent. Two communities claim possession of the structure situated in Tibha Dhana Sher. Until 1983, both communities would visit the site. While one community performed religious rites at the samadhi, the other offered prayers at the adjacent Dhana Sher Masjid. However, following dispute over the possession of the shrine in 1983 between the two communities, the matter was referred to the court of the SDM. The case is still subjudiced. A similar situation arose last year which led to tension in the area. Since then, a permanent police post was set up at the disputed complex. Yesterday, when some women wanted to perform religious rites there, they were prevented by the police. This led to a demonstration by members of the community, who according to the police, tried to force their entry into the disputed structure. The small contingent of the police could not prevent the mob from demolishing the outer wall and gate of the complex. However, reinforcements were rushed and the mob was prevented from causing any major damage to the structure. The police resorted to a lathi charge to disperse the mob. Eight persons were injured. The police has registered cases against 24 persons. Six of them have been arrested. They are Bimla, Meera, Omvati, Anil, Kallu and Sushil. This morning, at least 200 persons, including women, staged a dharna in front of the residence of the Superintendent of Police in protest against the police action. They demanded the release of the arrested persons. The chairman of Kalyan Committee, Tibha Dhana, has appealed to the people to maintain peace and communal harmony. Several social, religious and political organisations have appealed to the people to maintain peace. Inaugurating the Institute of Engineering and Technology at Jind today, the Chief Minister, Mr Bansi Lal, said that at present there were 11 engineering colleges and seven diploma-level institutions functioning in the State under the self-financing scheme and these were opened during the past two years. In addition, the government had also given approval to seven more self-financing degree colleges which would start functioning from this academic session. The Haryana Government, he said, had taken a number of steps to promote technical education in the State. Under the lateral entry scheme, 10 per cent seats were reserved for diploma holders in four engineering colleges, namely CR College of Engineering, Murthal, Vaish College of Engineering, Rohtak, MM Engineering College, Mulana, and ML Institute of Engineering and Technology, Radaur. Mr Bansi Lal said that this institute would have an annual intake capacity of 180 students and impart technical education in four disciplines, computer engineering, electronic and communication engineering, electrical engineering and mechanical engineering. Referring to the power sector, Mr Bansi Lal said that the people of the State would get round-the-clock electricity within the next one year. He said many ambitious schemes had been implemented by the government under which 3000 km new electricity lines were laid during the past two years and 15,500 km of new lines would be laid during the next two years. HISAR, Sept 5  Various deans and professors of Guru Jambeshwar University, here have sought the intervention of the Chancellor, Mr Mahabir Prasad, into the "growing interference" of the Department of Higher Education of the Haryana Government into the working of the university. In a letter addressed to Mr Mahabir Prasad, they have pointed out the alleged misbehaviour of the Director Higher Education (DHE) with the Vice-Chancellor in the meeting of the university's executive council. According to the letter, the DHE, arrived late on August 11, when the university's executive council was scheduled to meet. The DHE arrived only after the meeting was declared closed by the Vice-Chancellor. The former, however, wanted the meeting to reopen as he had some important points to make, the latter said. This was initially not agreed to by the Vice-Chancellor. However, after the intervention of some members of the council, the Vice-Chancellor agreed. The DHE wanted that the executive council, before approving the selection of different candidates for various posts, should study their bio-data. However, no consensus could be arrived on this issue. Afterwards, the DHE allegedly made some remarks which led to unruly scenes in the meeting. Some members of the executive council have already brought the issue to the notice of the Chancellor. What has irked deans and faculty members of the university is the explanation sought by the DHE, a few days after this incident on a reported anonymous complaint, levelling various charges against some university officials. It may be recalled that on August 12, only a day after the meeting of the executive council of the GJU, the Haryana Government banned all recruitments in three of the four universities, including GJU. It was followed by the DHE's letter to the university, seeking explanation on the anonymous complaint. Meanwhile, faculty members of GJU have urged the government to reconsider the ban on new recruitments, as the teaching work was suffering in the university. The Governor was obviously in a mood to do some plainspeaking. While he told the officials that genuine grievances should be redressed promptly at the right level, he called upon the teachers to behave with the students in such a manner that they should earn respect rather than anger from the students. The students, he also said, should look towards teachers with respect. The return of an award to the Governor by a teacher of Jind who had got it last year because of the harassment he had suffered at the hands of officials of the Education Department, death of a Sonepat student by consuming poison after having been tortured by a teacher and the unfortunate incident of a girl student of Kaithal who became unconcious after torture at the hands of the headmistress figured in today's function. The Governor took the officials to task who wanted to explain some of these incidents. He told them that the work of explanations should have been done at the right time and this was no occasion to do so. The Governor asked the Education Minister, Mr Ram Bilas Sharma, to order an enquiry into the unfortunate incidents that had come in to focus because of negligence on the part of certain officials. The Governor did not spare the Minister for having ignored the grievances of the people. The Governor also mentioned about letters which had been written to him by the people concerned and the relatives of the students affected by the misbehaviour of certain teachers. He handed over the letters to the officials who had earlier not taken any action and that was why the matter had been brought to his notice. The Governor also mentioned that officials of the Public Relations Department who did not bring the matter to the notice of the officials concerned should also be proceeded against. The Haryana Governor also called upon the teachers to improve the quality of education and infuse a sense of discipline, patriotism, honesty and cooperation among the students. He exhorted the teachers to improve the teacher-taught relationship by instilling sense of affection, amity, compassion and charity among the students. The Governor honoured 17 teachers of Haryana by presenting them State Awards for their outstanding contribution during the year 1997-98. Each award comprised Rs 2,500 in cash, a certificate of merit, a silver medal and a shawl. He also honoured 15 teachers of primary schools for the contribution made by them in compiling a book titled "Anatrang" for imparting primary education to the children by playway methods. Superintendent of Police, K. Selvraj said here today that the arrested had been identified as Munesh alias Munna of Nahri village and Manjeet of Rathdhanna village. Both, he said, had confessed to having murdered and thrown the body into the field of Nahri village after defacing his face with burns. The deceased, according to the SP, had escaped from Sonepat district jail after breaking its wall. Mr Selvraj disclosed that the police had taken into possession a shoe found near the body of the deceased. The photograph and shoe of the deceased, he said, had led to the identification of the deceased and the arrest of the accused of this case. He disclosed that Munesh and the deceased Rajesh were members of the same criminal gang. The deceased had been jailed in several criminal cases whereas Munesh had already been lodged in the jail after being sentenced by the court. According to the SP, Munesh and Rajesh had schemed to break jail. Initially, Rajesh escaped from the district jail after breaking its wall. After a few days, Munesh also came out from the jail and he along with Manjeet, met the deceased and they took him to a place where they offered liquor. When Rajesh was drunk, they attacked him and threw his body into fields of Nahri village after defacing. The SP also disclosed that the police also had recovered a wrist watch and a purse of the deceased during interrogation of the accused also involved in several criminal cases. An official spokesman said here today, that police had also registered a case of fraud against Mr Mahesh Kapil, District Manager, Haryana Agro, and Mr Rajbir, incharge of the wheat stocks. No arrests had been made. Meanwhile, police and officials of the Civil Supplies Department have seized 128 cylinders of the liquefied petroleum gas (LPG) at Sarai Khwaza and Ballabhgarh which were being tampered with. Satbir Singh, Mool Chand, Harish Chandra Garg, Jagdish, Devan and Ram Chand were arrested from Sarai Khwaza on Faridabad's border with Delhi. Bharat Lal, Ram Dayal, Mahavir and one more were nabbed at Ballabhgarh. Equipment being used for tampering with the cylinders was also seized. According to the SP, Mr Rajbir Deswal, a case under the HUDA Act has been registered against Amir Chand and Ashok Kumar, both brothers and residents of the local Basti Bhiwan. 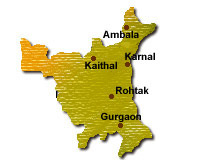 They had carved out residential plots from their 26 kanals and 10 marlas agricultural land at Fatehabad without getting the prior permission of the Town Planner. Another case has been registered against Dharam Chand, a resident of Basti Bhiwan, for carving out his 2 kanals and 7 marlas agricultural land into residential land without prior permission. In a third case of this nature, the police has registered a case against Sadhu, Krishan and Om Parkash, all local residents, for carving out residential plots out of their 1 kanal and 19 marlas agricultural land. KURUKSHETRA, Sept 5  The Haryana Chief Minister, Mr Bansi Lal, paid a surprise visit to Landa and Mohri villages, 30 km and 40 km, respectively, from here today. Mr Bansi Lal who was accompanied by Mr Ved Pal, Chairman, Agriculture Marketing Board, listened to the grievances of the villagers. He announced a grant of Rs 50,000 for each village school besides its upgradation from primary to middle school. He also assured that all damaged roads in two villages would be got repaired with immediate effect while a bridge on the village drain at Mohri would be constructed during the current financial year. The Chief Minister was on the way from Chandigarh to Delhi. SHAHABAD, Sept 5  The Haryana State Marketing Board will spent a sum of Rs 125 crore on the construction and repair of roads in the state during the current financial year. This was announced here today by the chairman of the Board, Mr Ved Pal. The Board had already completed 500 km length of roads, he stated. Addressing a public meeting in the new grain market, Mr Ved Pal threw light on the achievements of the HVP-BJP combine government during the past two years. The government was quite stable and would complete its full term of five years, he added. He disclosed that the income of the Board, which was Rs 75 crore per year during Mr Bhajan Lal's regime, had now risen to Rs 100 crore per year. He announced that Rs 53 lakh would be spent on the construction of roads and another Rs 7 lakh on electricity works in the grain market. YAMUNANAGAR, Sept 5  The third accused in the murder of four members of a family at Jagadhri has been identified. Mr Sheel Madhur, Superintendent of Police, Yamunanagar, said here today that Mr Pawan Kumar was the third accused. He said earlier two persons  Kamlesh and Babloo of Deoria village in Uttar Pradesh  had been identified. In all four persons were suspected to have killed the entire family of Mohan Singh, a businessman, on Wednesday night. Mr Madhur said a team led by an Inspector had been sent to Deoria in Uttar Pradesh. A special team of police officers, including Deputy Superintendent of Police, Jagadhri, Mr Om Parkash Kaidan, Inspector, Jagadhri, Mr Dhanpal Singh, District Inspector, Mr Varinder Vij and Sub Inspectors Charan Singh and Ratan Singh had been constituted to probe the facts. Mr Shashi Pal Mehta, Industries Minister, Haryana, visited the aggrieved families today. HISAR, Sept 5  Mr Relu Ram Punia, an Independent MLA from the Barwala assembly constituency, was today granted anticipatory bail by the District and Sessions Judge, Hisar, Mr R.N. Singal, in a case registered against him in Uklana police station under Sections 307, 506, 148, 149 and 120-B of the IPC. The case was registered on the basis of a complaint by Mrs Krishana Punia, wife of Mr Punia. The court also ordered that the petitioner join the investigations whenever required by the police. ROHTAK, Sept 5  The police has registered a case against Gaurab Deep Hooda, son of a former minister Krishan Murti Hooda, for allegedly abducting a girl. Mr Satish, a resident of Kamal Colony, has alleged that Guarab, Navin and two other persons abducted his daughter forcibly and escaped in a car. The police has registered a criminal case under Sections 363, 366, 504/34 of the IPC against Gaurab and his accomplices.